Rage Against The Machine to record again? Yesterday, a rumor quickly made its way across the blogosphere that the reunited Rage Against The Machine were beginning work on an album of new material. Apparently, a "source," possibly from within the band's label, Sony, said that the band was readying new songs to be released in 2009. "We're hopeful," the source explained, "but a new album is far from definite." Make that very from from definite. MusicRadar spoke with a spokesperson for guitarist Tom Morello, who said the story was "officially and unequivocally without merit. I can categorically deny this rumor. The band has no plans on recording new material." That would appear to be that then. 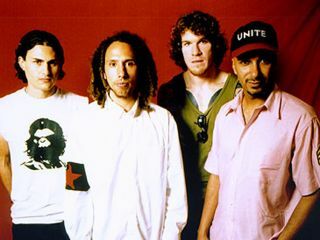 Since Rage Against The Machine reunited as a live act in 2007, they have been beseiged by questions as to when they enter the studio again (their last album was 2000's Renegades, which was comprised mostly of cover tunes). During an interview last year, Morello addressed the subject of a new album: "There are no plans to do that." he said. "That's a whole other ball of wax right there. Writing and recording albums is a whole different thing than getting back on the bike (laughs), you know, and playing these songs. But I think that the one thing about the Rage catalog is that to me none of it feels dated. You know, it doesn't feel at all like a nostalgia show. It feels like these are songs that were born and bred to be played now." This past August, in an interview with the Los Angeles Times, singer Zach de la Rocha has this to say: "We're going to keep playing shows - we have a couple of big ones happening in front of both conventions. As far as us recording music in the future, I don't know where we all fit with that. We've all embraced each other's projects and support them, and that's great." Those side projects include Morello's just-released second album as The Nightwatchman, The Fabled City (look for a MusicRadar review in the next couple of days), and de la Rocha's new band called One Day As A Lion. Currently, there are no additional Rage Against The Machine shows scheduled for this year, but the band hasn't ruled out future live work. Just don't go looking for a new album. As Morello's spokesperson put it, "We don't know where these rumors come from, but that's all this is: a rumor."